We love a hip hotel stay, but what if you’re travelling in a group or looking for a little privacy? Not everyone wants to dine at the restaurant every night, either. That’s why we’ve put together this collection of hotels with kitchen-equipped villas, cottages and other self-contained spaces available to book with Smith. So what’s it going to be: private-pool villa, riverside cottage or even a treehouse? Take your pick and make yourself at home. 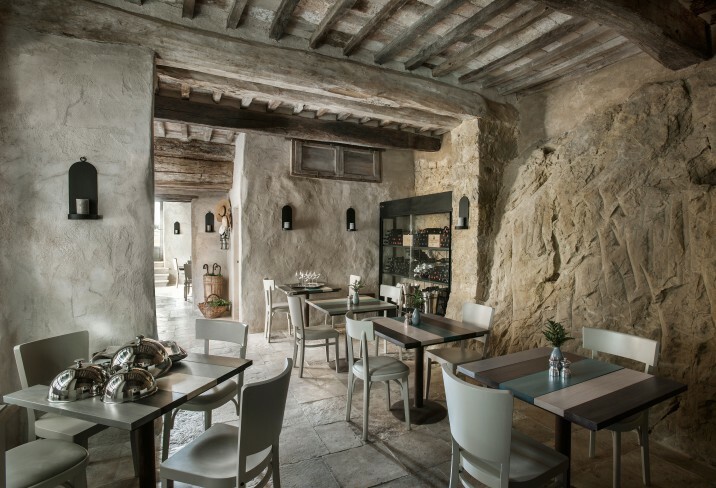 Monteverdi hotel has medieval charm by the village-load: cobbled streets, a tiny church, a sociable enoteca and a peaceful pool set in fragrant herb gardens. Holidaying historians will be pleased to know that there’s even 12th-century castle. Rooms are decorated with rustic romance – elegant four posters and rich paints in herb and flower hues – and some of Italy’s best Winelands beckon. Tip: Welcome reception including a glass of prosecco and selection of local cheeses and meats. A high-flying hideaway of intimate suites in blissful Crete, Domes of Elounda hotel is all about smooth-edged architecture with Moorish touches, first-class dining from the country’s only Michelin-starred chef, and the sun-soaked sand of the hotel’s private beach. A sparkling spa will have you feeling brand-new, like Aphrodite fresh from the sea. Tip: A Thermae Experience for two in the spa, or GoldSmith members staying seven nights or more get a three-course dinner. Tip: Champagne and fresh fruit on arrival, a romantic bath on the first night, and a Casa Angelina gift on departure. A collection of villas arranged like a traditional village – plus the luxe additions of a golf course, two beach clubs and a knock-out spa – hotel Borgo Egnazia is a modern-day castle on Puglia’s sun-swept seashore. The romantic interiors are designed with sumptuous white-on-cream décor and nature-inspired flourishes like almond-filled baskets, bird cages and egg-shape ornaments. Tip: Fruit and a bottle of spumante. A three-storey whitewashed retreat on Spain’s Golden Mile, hotel Puente Romano Beach Resort Marbella is a village-style set-up with seaside tennis courts, three pools and eight restaurants. The scattered layout and intimate atmosphere set it apart from nearby oceanfront mega-resorts on the Andalusian coast. Tip: For BlackSmith members, a bottle of Oloroso sherry; for SilverSmiths, a package of gourmet Spanish olive oil; for GoldSmith members, a bottle of champagne. Set near the coast in Hampshire, Chewton Glen hotel is a stunning manor, spa, restaurant and country club that perfectly combines old-school elegance of the Jeeves & Wooster era with stylish modern touches and updates. The treehouse suites takes luxury to new heights – the forest canopy, to be specific. And, with a staff-to-guest ratio of two-to-one, it’s hard not to feel like royalty at this haven, the only privately owned five-star hotel in the UK. Tip: A half-bottle of champagne in your room and breakfast (usually £20 a head). Basking in the Dordogne Valley, hotel Château les Merles is a neoclassical country estate revived with high-style Philippe Starck furnishings and sleek modern finishes. After dining on delicious Perigordine cuisine, take a moonlit turn around the groomed grounds with top-notch vineyards, inviting pool, tennis courts and golf course of this 17th-century manor. Tip: A free glass of champagne, a selection of regional amuses bouches and a bottle of wine from the vineyards of Château Les Merles. A grand estate fit for a royalty, the Lime Wood hotel in New Forest has a history dating back to the 13th century, where it began life as a hunting lodge. In the 1740s, the manor was reclaimed by the Duke of Clarence. Since then, it has had an elaborate makeover, with exquisitely designed interiors, an indulgent spa, fantastic restaurants, and gorgeously landscaped grounds. Tip: A bottle of champagne. Named for the treasure once rumoured to be buried somewhere in this vintage Aude countryside maison de maître near Mirepoix, hotel Le Trésor could be turned upside down and reveal nothing but airy rooms, crisp linens and rustic furnishings. But the real gem of this little boutique property might be the tree-shaded terrace garden in one of France’s most unspoilt wine regions. Tip: A bottle of local wine. Between the mountains and the Mediterranean, hotel Paradise Island Villas is a family-friendly stay in Crete, right outside Anissaras. Terracotta-tiled floors and bougainvillea-lined walls belie the minimalist aesthetic inside, where earth tones, neutral hues and classical furniture predominate. The private gardens, though, are all decadence. Set in a handsome manor on 18 landscaped acres in Somerset, Babington House hotel brings a little bit of cosmopolitan London cool to the West Country. The rural cousin of the exclusive Soho House, it’s the perfect spot for stressed urbanites to unplug and unwind. The staff is hip, friendly and, refreshingly, not in uniform. The Cowshed spa, indoor and outdoor pools, billiard room and on-premise cinema may make you reconsider a return to the city. Tip: A full-size Cowshed bath product. Sprawling across 100 acres of verdant parkland near Slane in County Meath, Tankardstown House hotel is a charmingly coiffed former family home that bears the refined touch of its mindful matriarch. Should you care to ramble about the ample green grounds, this elegant estate will loan you boots and one of its four dogs to help you cultivate your inner country squire. Tip: A bottle of prosecco in room on arrival.